3,844 poker players competed over 4 grueling days of poker for a $3.4 million prize pool in Event 54 of the 2010 World Series of Poker, a No Limit Hold'em event. 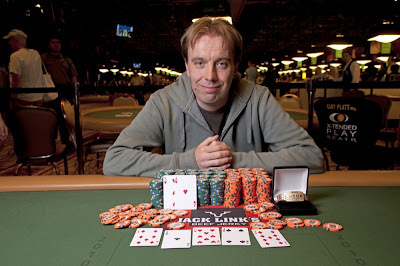 396 places grabbed a piece of the prize pool with the first place prize of $570,960 and a WSOP gold bracelet going to 36 year old theoretical physicist Marcel Vonk from Utrecht, Holland, who marked his second time to cash in the WSOP in only the fourth event he has ever played. That's a pretty impressive batting average. “It means a lot. When I first started playing, I was an amateur player. And while the money means a lot, I play in tournaments because I want to win something. Otherwise, I would play in cash games. The $500,000 is a lot. But the bracelet is almost more important than the money," explained Marcel Vonk on winning the WSOP gold bracelet. The runner up was 23 year old poker pro David Peters from Toledo, Ohio, who marked his second time to cash this year, which paid a very respectable $350,803 in prize money. The third-place finisher was Paul Kerr from Bothwell, England, who now has two cashes at the WSOP with this payout totaling $255,076. The fourth-place finisher was Nathan Jessen from Blair, New England, who marked. He marked his first time to cash at the WSOP in Las Vegas, which paid $186,818. The fifth-place finisher was 22 year old poker pro Henrik Tollefsen from Trondheim, Norway, who got paid $138,107. The sixth-place finisher was Matthew Lupton from Scottsdale, Arizona, who got paid $103,061. The seventh-place finisher was Mehul Chaudhari from San Francisco, California, who won $77,633. The eighth-place finisher was 24 year old Espen Moen from Bodo, Norway, who cashed for $59,020. The ninth-place finisher was 24 year old poker pro Dustin Dorrance-Bowman from Austin, Texas, who marked his second time to cash at the WSOP, which paid $45,286. Former WSOP gold bracelet finishers who cashed in this event included – Jesse Rockowitz (33rd), Al Krux (118th), Frank Gary (234th), James Dempsey (277th), and Toto Leonidas (358th).